Trevor Day at Mount Everest base camp. Trevor Day, associate professor of physiology at Mount Royal University in Calgary, Alberta, Canada, is giving a lecture today (Tuesday, April 16) hosted by the Department of Exercise Science in the School of Education. 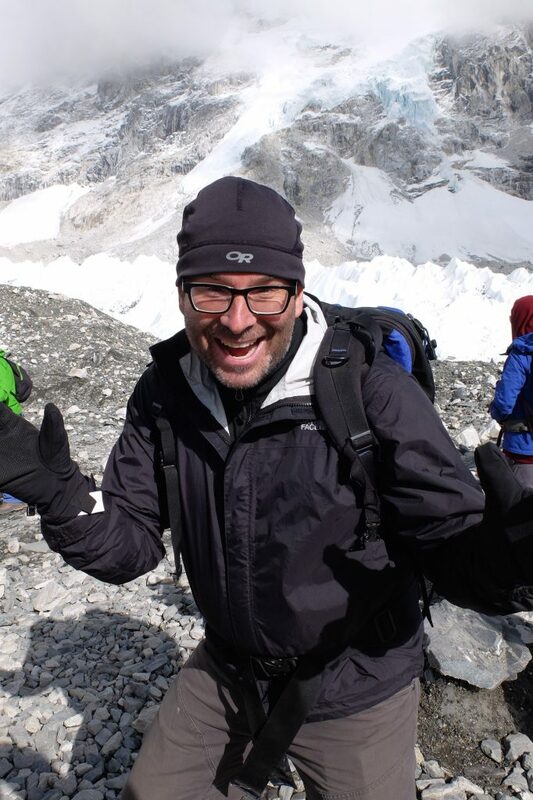 His talk, “Cerebral Blood Flow Regulation During Incremental Ascent to Everest Base Camp in Nepal,” is at 7 p.m. in Maxwell Auditorium in Maxwell Hall. To request accommodations, contact Julia Fuqua at jafuqua@syr.edu or call 315.443.2115. Day is an integrative cardiorespiratory, cerebrovascular and acid-base physiologist committed to physiology education through his teaching and laboratory research in basic and applied human physiology. His laboratory and fieldwork research interests and expertise include the chemoreflex control of breathing in response to acute and chronic blood gas challenges (e.g. high altitude), cardiorespiratory reflexes and interactions, orthostatic stress, cerebral blood flow regulation, acid-base physiology, sedentary behavior and sleep apnea, all in healthy human participants. Day has worked extensively on the physiology of high altitude in the Mount Everest region since 2012 and has organized or co-organized three previous research expeditions to Everest Base Camp in the Nepal Himalaya (2016, 2017, 2018). He was an expert collaborator on the 2018 Syracuse University Mount Everest expedition led by Tom Brutsaert, professor and chair of the Department of Exercise Science, where 29 students and scholars participated in various field research studies on the human body’s response to high altitude. He also has an active interest in science communication, particularly how scientists can better engage the public in the importance and relevance of the scientific endeavor.